Depth profiles of these tracers are non linear, indicating that these profiles are overprinted by deep water circulation. These bended shapes allow identifying convection processes in the NW basin and occurrence of depleted Aegean and enriched Adriatic waters. 99% of the 230Th and 94% of the (although more soluble) 231Pa in situ produced are scavenged and deposited within the Mediterranean Sea. The fractionation factors between Th and Pa (FTh/Pa) are low, reflecting the important removal of the 231Pa compare to the open ocean. The 232Th distribution mainly reflects the input of lithogenic material from rivers and/or sediment resuspension. 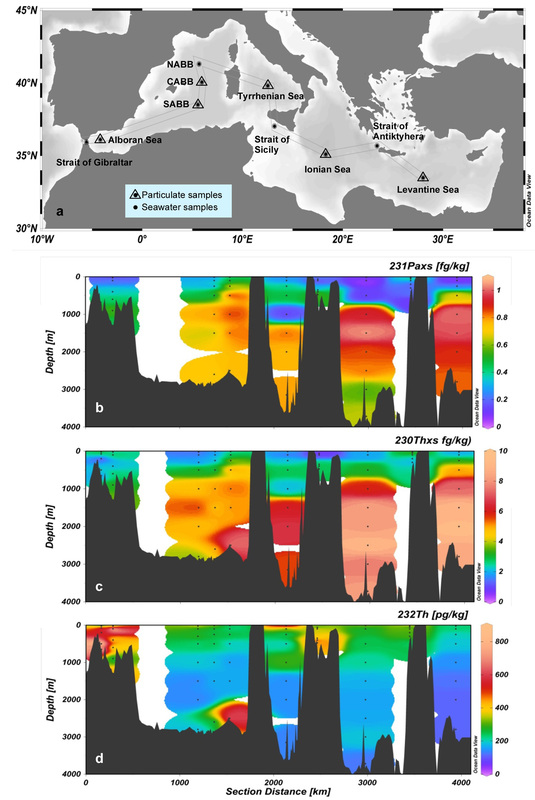 Figure: Map of (a) Pa-Th sampling sites and and section plots of (b) 231Pa, (c) 230Th, and (d) 232Th measured in unfiltered seawater sampled along the GEOTRACES GA04 section in the Mediterranean Sea. SABB: Southern Algero-Balearic Basin, CABB: Central Algero-Balearic Basin and NABB: Northern Algero-Balearic Basin.